Both The Wall Street Journal and Barron’s are offering significant miles/points bonuses with a subscription sign-up. Barron’s and The Wall Street Journal are currently offering a 2-month subscription for only $1. Obviously, after the 2-month promo period ends, the monthly subscription rate will be much higher. For that $1, you’ll get 1,300 American Advantage miles, 1,000 United MileagePlus miles, or 950 Southwest Rapid Rewards points with the current sign-up bonus promo. Delta and Alaska have sign-up bonus promos running as well. The play with this deal, however, is to sign-up for the 2-month subscription, pay the $1, get the larger than normal Miles/Points bonus, and then cancel after the required 45-day active period ends. 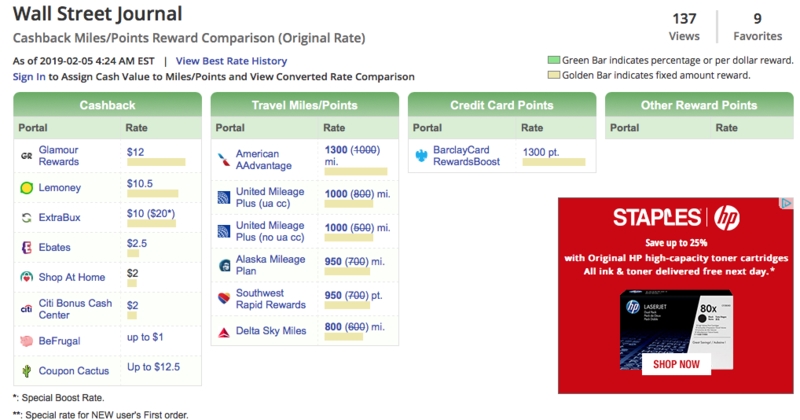 Basically, you’re buying a nice chunk of Miles/Points for only a dollar. If you haven’t been targeted via email for these promotions, you can click through your preferred Cashbackmonitor.com airline shopping portal link to make your purchase. Be sure to read the fine print associated with the deal(s) before making the purchase. If you want to continue the subscription at whatever rate will be charged after the $1 for 2-months promo ends, then it’s not a big deal. However, if you only want to take advantage of buying Miles/Points for $1, then be sure to look closely at the requirements – like keeping the subscription active for at least 45 days. And then cancel soon after the 45 days are up. Cutting it too close to the 2-month mark might result in at least one month of a full subscription rate being charged to your credit card. In most states, you’ll have to call a toll-free number to cancel your subscription. I believe California is the only exception – you can cancel online. Yes, they’ll put the hard sell on, just keep firm that the paper/magazine is not for you after the 2-month trial, and they’ll ultimately relent.